Movement - PKSV-UI Users Come Here! For R/S/E version, go here. So, did you have fun trying to give your player items? Well, I hope you did, because item giving is about 30% easier than today's lesson. Meaning, if you didn't understand the previous lesson, you should review it before coming here, because movement scripts will use the element of 'flags' as well. So, if you understand flags, you'll be fine. Now, if you've played pokemon, you'll know that sometimes, when you talk to a person, the NPC can make you follow him/her (Talking to the person in Pewter City to lead you to gym is an example). This is what we will learn today (obviously). I posted an example of a movement script below the youtube video. The script below this text is NOT the script for the video. Now, that's a lot to swallow huh? Well, this isn't really 'typical' (this was my youtube video script), but all of a movement script's basic components are in this script. Now, we see some new things in the first paragraph. I repeat this concept 4 times, so I'll just discuss these 2 lines. As you can see, we have a 'if-then' statement again. This time though, we are comparing 'PLAYERFACING'. So, when you talk to an NPC, you can talk to the NPC from 4 different directions. Now, we have a 'call' command. This is the opposite of the 'jump' command. In a 'jump' command, we 'jump' to a new location of the script. But, in a 'call' command, we merely 'go to the location' of the script we are 'calling', but we MUST COME BACK to the main section of the script (where the 'call' line was stated). We have a new 'callstd' value here as well. In a 'NOCLOSE' value, the message will not close. This can allow us to make stuff happen while the message box occurs. As you can see, I put a 'pause' command to 'pause' the game for a short duration. To close the message, you need a 'closemsg'. This command will 'close a NOCLOSE' when you click the A button. These lines are the main attraction to this lesson. This is what makes the NPC or PLAYER move in a script. The line is 'applymovement 0x(person event number) (You can also use PLAYER) @(offset value)'. After the event, we must use a 'pauseevent 0x0'. This is like the 'end' command of a script, but used for 'events'. If you don't have this command, your game will crash. Fadedefault will make the game return to the state before you talked to the NPC. So, if you had a music change, or you changed the map (both you will learn in future lessons), a 'fadedefault' will return the game to the original music and map. As you can see, flags have returned. In my script, after you walk with the NPC, the NPC walks back home. However, you don't see him walk all the way (he exits the game's borders), so I removed him as soon as he left the screen. This is done with a 'disappear' command. The value is the person event number. I set a flag here to make sure the NPC doesn't reappear when you walk a step. Make this flag number the NPC's ID number. If you go to one of the offset values that you 'called' in the 1st paragraph, you notice that the last line is 'return'. As I said before, 'calling' just 'borrows' the script, so you do not stay in the new paragraph, like in a 'jump' command. So, you have to 'return'. If you go to the movement offset values, you can see some differences with a message offset value. So, for a movement offset value, don't use a '='. Use a 'M' (for Movement). Then you will enter the movements. Here are the general commands you can use (there are more which I will not discuss for now). walk_(direction up, down, left, right) will make you/NPC walk 1 step in the direction you picked. run_(direction up, down, left, right) will make you/NPC run 1 step in the direction you picked. This is different from walk, since when you run, you move faster. So, a run will make you get to your destination faster. look_(direction up, down, left, right) will make you/NPC look in the direction you picked. You will not move from the spot. say_(expression !, ! !, =), X) will make you/NPC say an expression (that box thing that appears above your head). You can use the movement generator with PKSV-UI. Go to Tools, and select 'Movement Helper' (Or click Control+M). 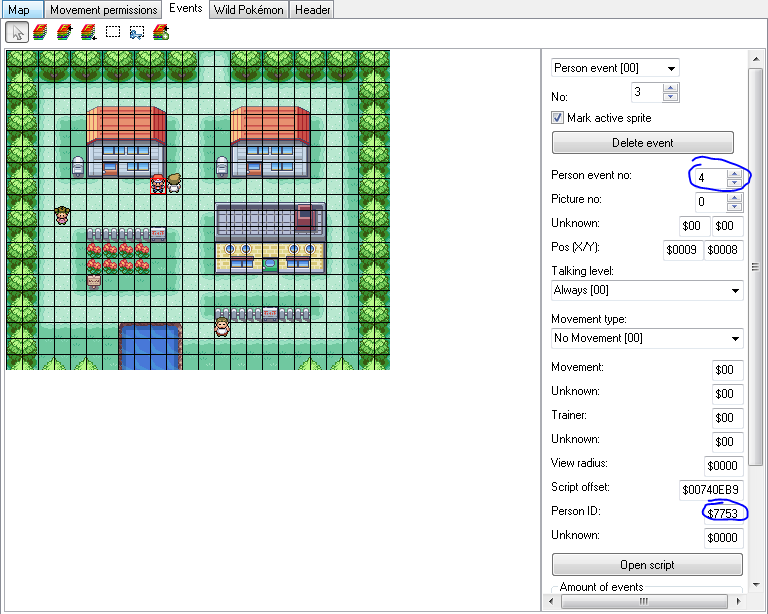 Note: For R/S/E users, the movement generator WILL NOT WORK! This is only compatible for FR/LG. R/S/E uses different codes for movement scripts. Okay, so now we got all that explanations out of the way. Lets make a simple movement script. Scenario: When you talk to a person from any direction, this person will lead you to a house. 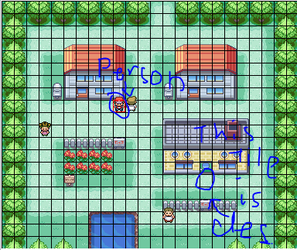 (Mine will lead the player to Oak's Lab). Afterward, the NPC will walk off the screen, and disappear. Note: For the flag, you should use your own if you assigned another flag for the ID number. 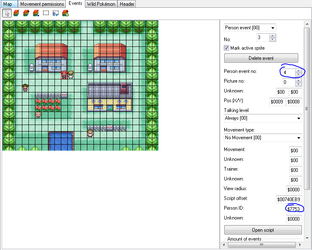 Writing movement scripts can help a player find a certain location. However, you usually don't use a movement script when you talk to someone. A movement usually occurs when you A. Step on a certain spot/tile B. Ask a question about where to go C. Trigger an event. In the next lesson, we will go over 'level scripts', and move away from these 'basic scripts'. So, master these four lessons before we begin the 'intermediate' side of PKSV-UI.